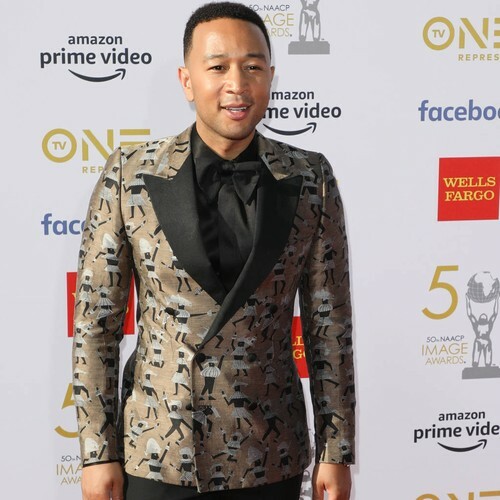 John Legend's attempts to learn swimming got an extra boost on Monday (08Apr19) as he was joined in his pool by Olympian Ryan Lochte. The All of Me singer revealed in January (19) that he was taking swimming lessons for the first time since he was five years old, in a bid to be able to enjoy water-based activities with his two children. He's been working hard on learning to swim since then, and on Monday, shared on his Instagram story that sportsman Ryan had popped round to encourage John in his pursuits. "Swimming with @ryanlochte in my backyard", John wrote alongside the video, which showed him managing an impressive front crawl before standing up proudly at the end and exclaiming jokingly "I made the team!" Ryan, 34, shared a similar video on his Instagram page, writing: "Not a bad way to start my week. Swimming with @johnlegend giving him some swim tips and getting him ready for 2020 Olympics haha! cred @amber_mazzola @kidswimla @tyrsport #teamtyr #beverlyhills #olympianontherise." After John shared the video, he was contacted by Olympic swimmer Kristy Kowal, who wrote: "Moving to California this week! Let me know if you want lessons for you and your kiddos!!'#swimmingolympianforhire." John has been sharing videos of his progress in his swimming journey on social media over the past few months, and previously told People that he is already feeling much more "confident" in the water.